A couple of 80s cult classics are getting reboots from SyFy. Both Critters and Killer Klowns From Outer Space are set to get long overdue new entries from the cable network. At the present time, there aren't many more details beyond the fact that these movies are finally looking to make a comeback, but if this new report turns out to be true, then these may not be the only classics getting reboots from SyFy in the near future. According to a new report, SySy is looking to make reboots a big part of their business model moving forward. Part of that includes licensing the rights for both Critters and Killer Klowns From Outer Space. The wording in the report is pretty specific in that SyFy would just be licensing the rights, not necessarily in control of them entirely. Where it gets more vague is that these are both going to be "new feature films." So does that mean a continuation of sorts that modern audiences can still enjoy (a requel, if you will), or a straight-up remake/reboot? At this point, it's tough to say. Starting with Critters, this seems like the perfect thing for SyFy. The series started out in 1986 and came in the wake of the success of Gremlins. The movie centers on some small, violent little aliens who torture some fine folks in a small farming town. The movie spawned several sequels including 1988's Critters 2: The Main Course, 1991's Critters 3 (which actually gave Leonardo DiCaprio his first movie role) and 1992's Critters 4. The Critters franchise has been dormant ever since. Though, there was talk of a possible TV series in the works early this year. As for Killer Klowns From Outer Space, the movie was originally released in 1988 and has since gone on to gain serious cult status. Directed by Stephen Chido, the movie though bizarre as they come, is relatively simple in terms of plot, centering on aliens who look like clowns ripped from nightmares who make their way to small town on Earth and, well, kill people. There has been talk of doing a sequel or reboot for some time, with the Chiodo brothers discussing plans for a new trilogy back in 2016, which never materialized. So, despite its cult status, the property has sat untouched for 30 years. It would be tough to make new movies based on either of these properties for a very wide audience, but SyFy has the perfect niche to serve just such reboots to. This also isn't the first cheesy cult franchise they're rebooting. They also have Leprechaun Returns set to debut in March 2019. 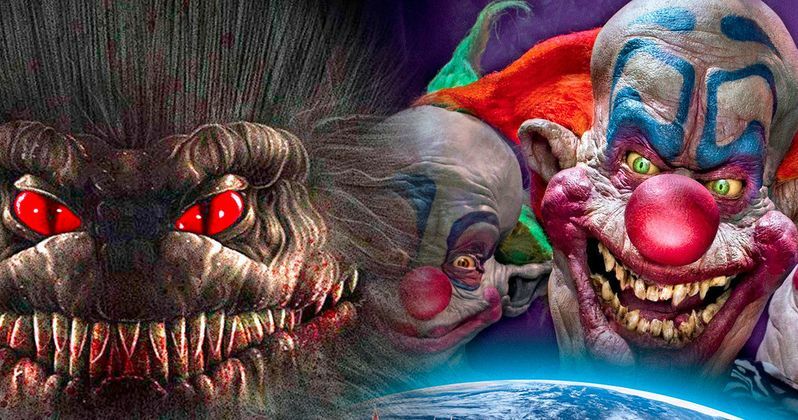 For now, there is no word on how quickly the turnaround could be on Critters and Killer Klowns From Outer Space, nor is it clear which would end up happening first, but we'll be sure to keep you posted as any further details are made available. This was first reported by Bradley Miska over at Bloody Disgusting.